Cape Cod that is. We had cautiously tracked Hurricane Sandy that week and after multiple cancellations and reschedules, we finally made it out to see our friends, husband-and-wife oyster farmers, Kevin Flaherty and Tamar Haspel of Barnstable Oyster. 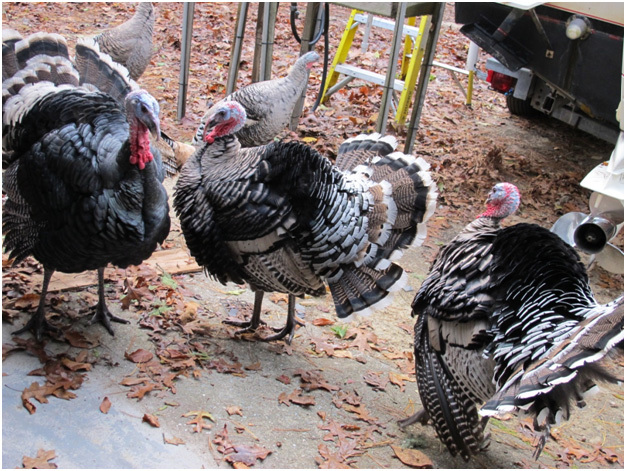 Upon arrival at their “shack” as they fondly call it, we were greeted by the welcoming committee of turkeys. This was just a prelude to a glorious day of sharing in Kevin and Tamar’s intimacy with the land and knowledge of animal husbandry. 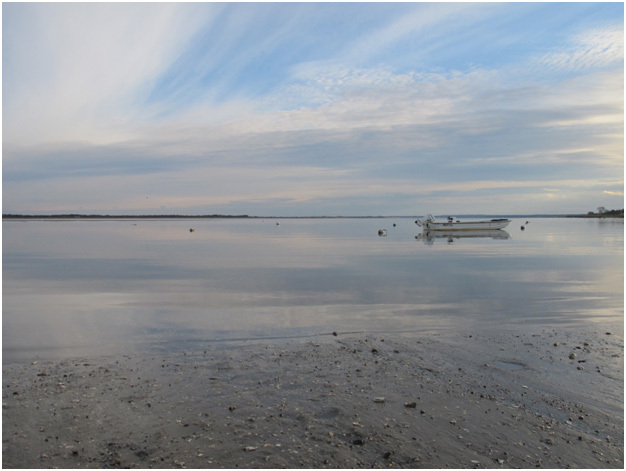 Within 15 minutes of arriving, to catch the low tide, we suited up into waders, hopped in the truck and headed off to Scudders Lane to launch the boat and visit Kevin and Tamar’s lease on the grant. It was the first sunny day after Hurricane Sandy had passed. Kevin and Tamar had not visited the site since before the storm, so we were not sure what would greet us–though the beautiful weather conditions offered a promising omen. Kevin, our dependable captain, navigated us through the shallow waters (some parts were only six inches deep!) to their farm. 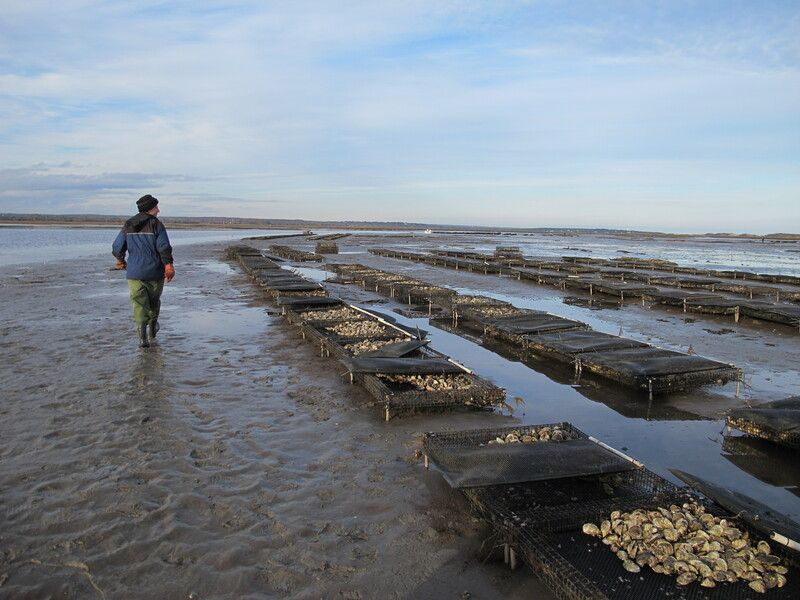 We knew we were in oyster land upon seeing tidy rows of oyster trays on the muddy landscape. We anchored the boat, and Kevin and Tamar began surveying any potential damage from Sandy. I took a minute to digest the breathtaking vista before trailing behind Kevin and absorbing every little detail he shared about the farm and their oystering methodology. Kevin and Tamar are both encyclopedias of knowledge and not only that, they are consummate perfectionists. 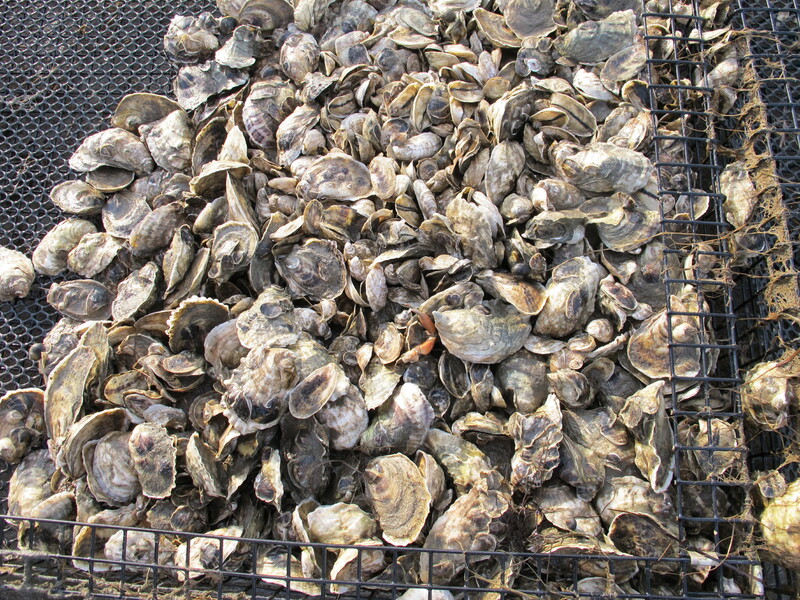 Perfectionism and oystering don’t often mix. Let me revise that: Perfectionism and mass production oystering don’t often mix. What Kevin and Tamar are doing is as far from mass production as you can get. Early on, they both decided that they wanted to do everything themselves, which meant they would be working with much smaller quantities than most average oyster farms. 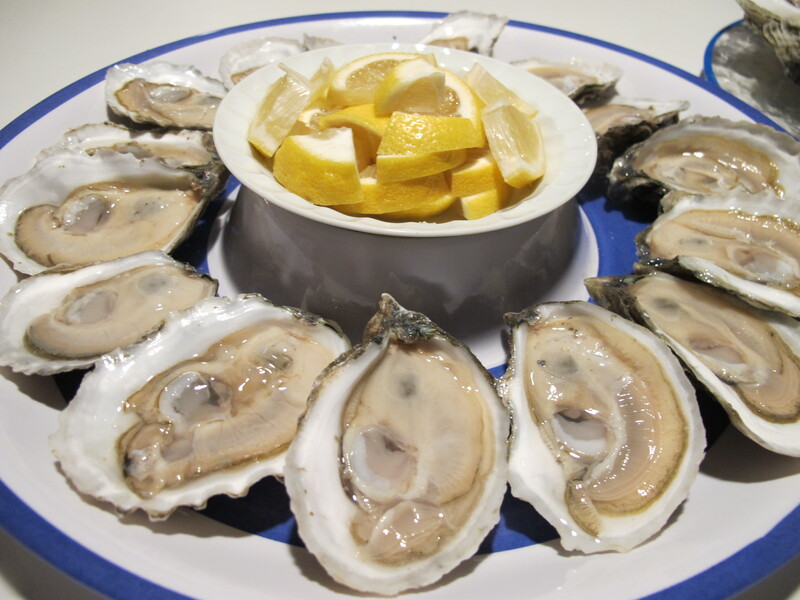 For instance, instead of loading their trays up with 1,000 spat, they limit their trays to only 250 baby oysters. They aim to harvest 30,000 oysters a season…a stark contrast to farms that may ship that number in a week! After inspecting each row, Kevin and Tamar, determined that the damage was minimal and only a few bags were blown loose, of which only one or two were completely open. We quickly gathered the loose spat and fastened any unsecured bags with zip-ties. Although Kevin and Tamar claim they can’t control the flavor of the oyster, they do try their hardest to make their oysters look fantastic. They take great care while harvesting, in cleaning the shells and removing barnacles and spat that may have attached to the oyster, all thanks to a “sink” that Kevin has rigged up on-site during harvest days. Since he and Tamar are hand-harvesting anyway, it’s only a matter of seconds to remove anything that may make it hard to shuck the oyster, or even worse, make the oyster smell like dead barnacle. But they don’t just leave it at that. For pure aesthetics, so that the shells don’t retain “scars,” they remain in the trays for another week so that the tidal waters can give the shells a more perfect complexion. I was sent home with a bag of oysters and two smoked bluefish, but not before I had a sweet snack of fresh figs (from the tree growing on their property) and honey (also from the hives on the property). I was grateful that we were able to get out and visit the farm despite Hurricane Sandy. I was in even more awe of Kevin and Tamar’s operation knowing that it is always and only the two of them who care for and produce the Barnstable Oyster that is consistently amazing.